Meigs Career Based Intervention students made their business pitches last week. The team of Kole Lambert, Sean Myers, Chelsea Thomas and Tierra Tillis presented the idea for Meigs County Offroad. 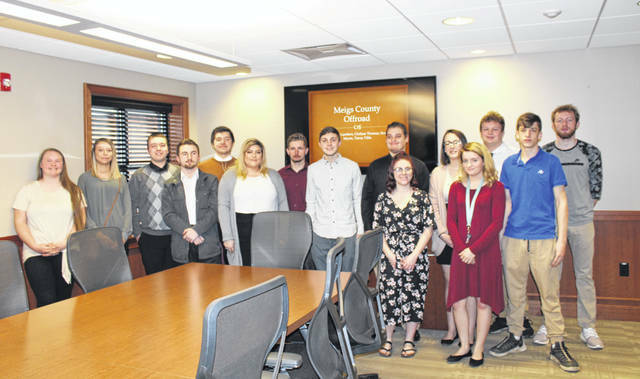 POMEROY — Students from Meigs High School’s Career Based Intervention class made their business pitches last week to representatives from Farmers Bank and the Meigs County Economic Development Office. Students in four teams presented business plans for their ideas to Economic Development Director Perry Varnadoe, as well as Farmers Bank CEO Paul Reed, CFO Shawn Arnott and Senior Vice President Eddie Lanham. The students are taught by Amy Perrin. Students had prepared business plans including information on the type of business, how they would market it, start up cost, business expenses, potential profit, leadership structure, clients, and other items. The first team of Kole Lambert, Sean Myers, Chelsea Thomas and Tierra Tillis presented the idea of Meigs County Offroad. Meigs County Offroad would be a regulated area for ATV trails, camping and hiking. The students made their presentation, with Varnadoe, Reed, Arnott and Lanham then taking turns asking questions and giving feed back to the students as they would with any other business proposal which came before them. The other three teams presented their idea for different restaurants. Bahama Mama’s World Cuisine Restaurant was presented by Brandon Justis, Hailey Marcum and Sheryl Scions. Riverbank Cafe and Canoe/Kayak Rental was presented by Jillian Casto, Tiffani Jacks, Tyler Johnson and Jake Roush. Shooters Burgers and BBQ Restaurant and Indoor Shooting Range was presented by Cooper Darst, Shawn Thomas, Draven Walker and Brady Young. https://www.mydailysentinel.com/wp-content/uploads/sites/14/2019/03/web1_3.21-CBI-1_ne2019320122727751.jpgMeigs Career Based Intervention students made their business pitches last week. https://www.mydailysentinel.com/wp-content/uploads/sites/14/2019/03/web1_3.21-CBI-3_ne2019320122736507.jpgThe team of Kole Lambert, Sean Myers, Chelsea Thomas and Tierra Tillis presented the idea for Meigs County Offroad.